1. Preheat oven to 350 degrees. Liberally salt and pepper each side of the chicken breasts. Sprinkle each with a pinch of sugar (this step really helps crisp the skin). 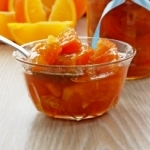 Whisk together the balsamic vinegar and orange marmalade; add a few tablespoons of water or chicken stock to thin and set aside. 2. Heat up a pan with olive oil. Sear the chicken breasts, skin side down, until golden brown. Flip the breasts in the pan. Lower the heat and deglaze (clean the bottom of) the pan with balsamic vinegar/marmalade mixture. 3. Add artichoke hearts to pan and baste. Baste the skin side of the chicken, now facing up, with the liquid and place in a 350 degree oven to finish cooking (about 8 minutes depending on thickness). Finish with fresh chopped chives for color and a good bite.